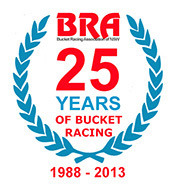 Round 2 of 2014 PCRA-BRA Bucket Club Championship. 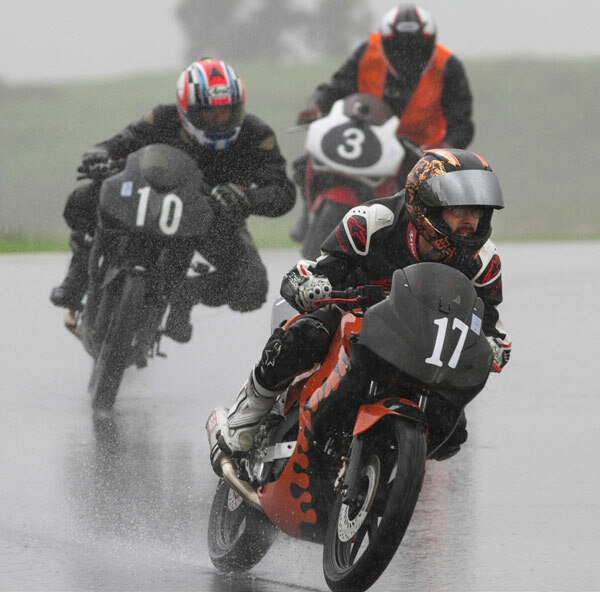 Round 2 of the PCRA BRA Championship at the South Circuit at Eastern Creek was a wet and windy affair. The weather was dry but overcast during early morning practice / qualifying but then the rain came bucketing down before the first race had started. This made for some exciting racing albeit at a much lower pace in the slippery conditions. 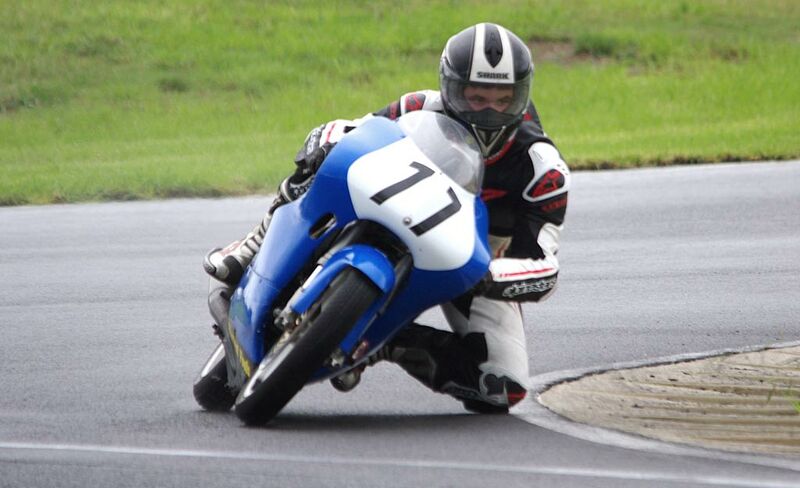 #77 Tyler Bradford (Harvest Pools BBE CBR150) showed that smooth and tidy is the way to go. 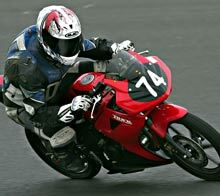 Tyler won Race 1 from a fast improving #41 Andrew Bennett (Honda RS80CR). 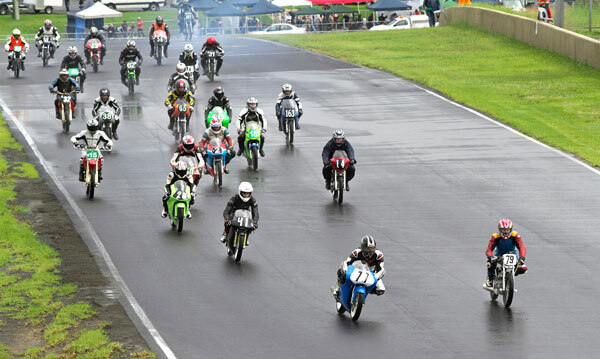 #79 Stephen Kairl (Supermono 150) finished 3rd followed home by #28 young Jack McGauley (Honda RS85cr) 4th. tailed by his dad #32 Marty McGauley (Honda CR85) in 5th. place. 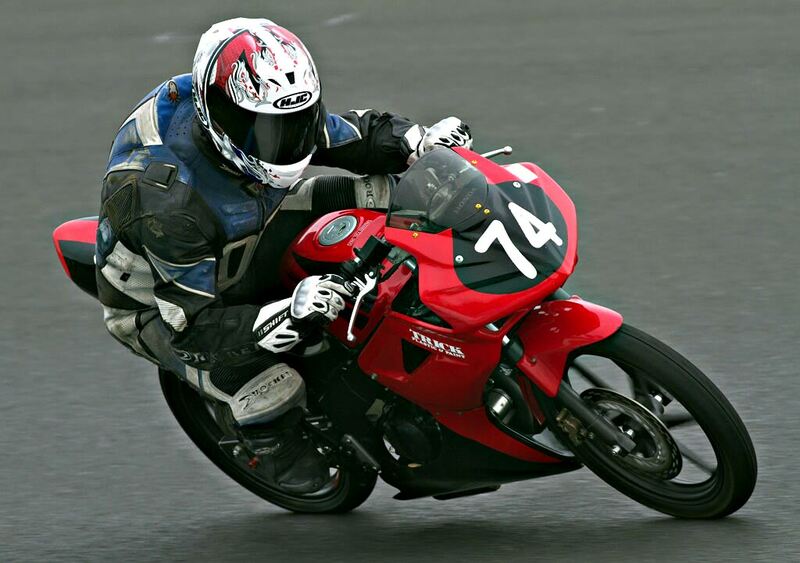 #14 Ken Lawrence was next in line using his "wet weather Bike" his P4 125 instead of the fuel injected RS150CBR. The order was looking the same for race 2 but Andrew Bennett went down in the treacherous conditions. He got going again but he was out of the hunt. With #77 Tyler Bradford (BBE CBR150) looking like he was racing to another win, it seemed all over until #86 Anthony Marsden (Chris Sculley Honda RS85cr) arrived on the scene to steal the lead in the last corner and win the dash to the line. Anthony had started dead last and lapping in the 1 min 14s bracket made it one of the outstanding rides of the day. 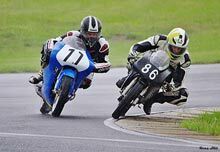 #79 Stephen Kairl (Supermono 150) came home 3rd on the Supermono150 netting 2nd overall on the day.. #32 Marty McGauley (Honda CR85) was next with #23 James Barclay on the ex Garry Briggs (BBE RS150crfr) 5th. making his long journey down from Queensland worthwhile. 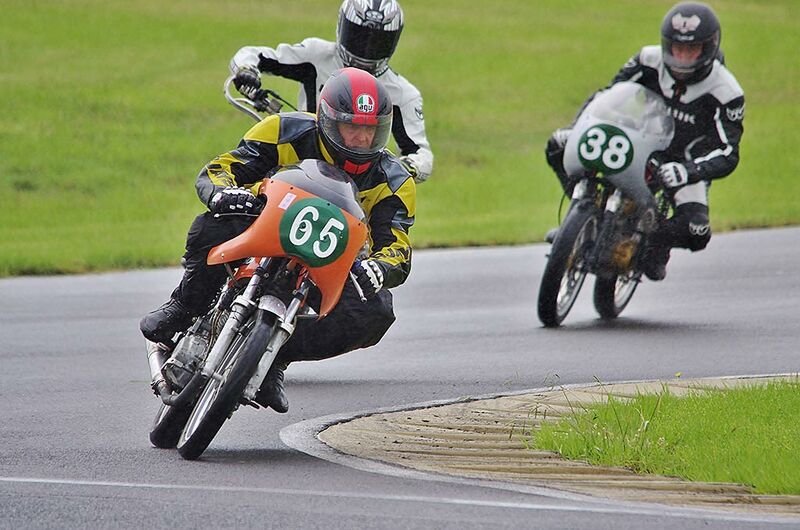 #65 Tim Smith (Honda CB150) proved to be the rainmeister in the Superlite PRO class, winning both races convincingly. 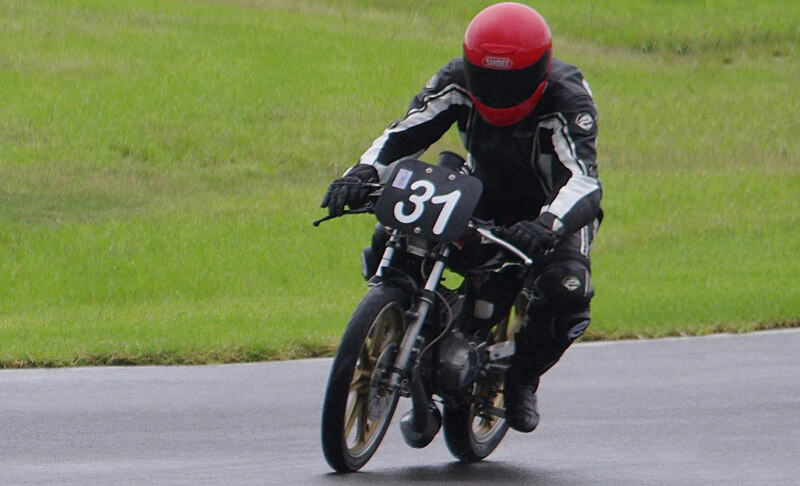 #38 Walter Murphy (BBE Honda CB150) came 2nd both times and #2 Ken Lindsay (KLR Honda RCB150) 3rd. 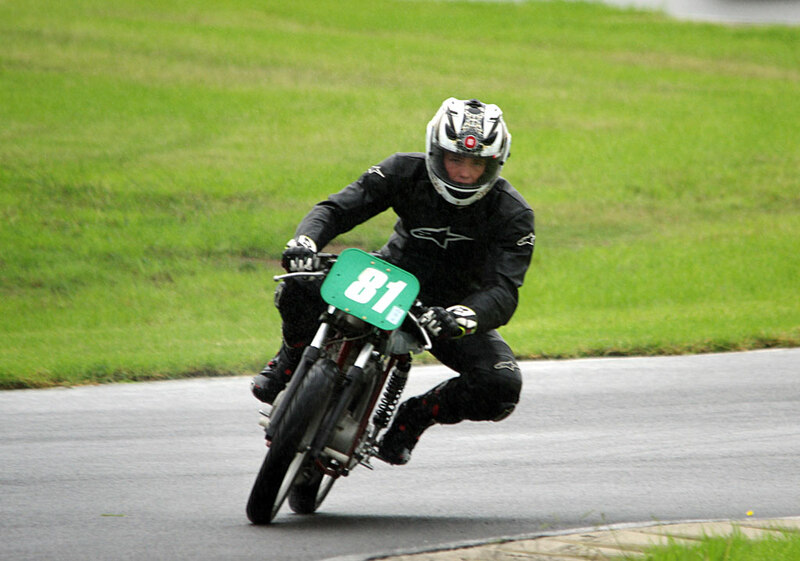 #169 Ian Gregory (Honda CB150) had a day he'd rather forget as his bike stopped in race 1 with water in the works. On race 2 he was leading when the gremlins struck again although this time he manage to limp home to 3rd place with Ken Lindsay tip toeing home to 4th. #31 Duncan Taylor (Kawasaki KH100) won race 1 from #81 Robert Tisdell (Honda CB150). 3rd was the ever hard riding #8 Kurt Wagus (BBE Honda CB150). followed by #88 Mark Robertson (Suzuki100), #62 Jim Murphy (BBE Honda CB150) and newcomer #164 Darrell Francis (Honda CB150). 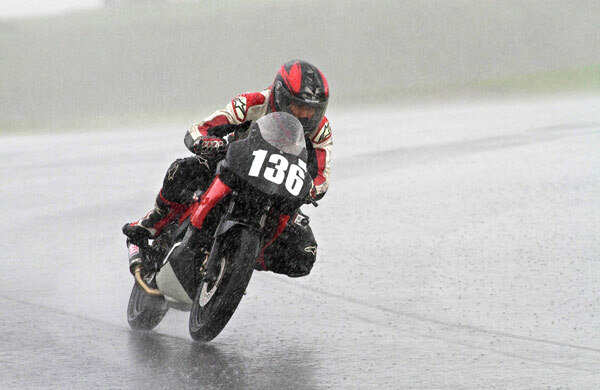 Glenn Tisdell (Suzuki150) slipped down the Championship ladder with 2 DNFs, the little Suzuki suffering electrical problems in the wet conditions. #81 Robert Tisdell (Yamaha YFZR125) proved his 2nd place in the race one wasn't a fluke as he ran away with the 2nd AM race. 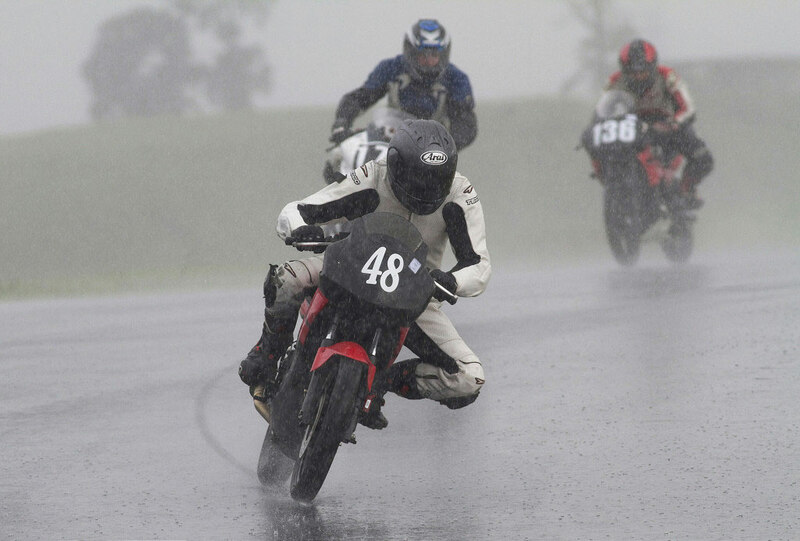 #8 Kurt Wagus (BBE Honda CB150) consolidated his championship lead with a fine 2nd in the tricky conditions. Duncan Taylor was 3rd with Jim Murphy 4th. followed by 88 Mark Robertson (Suzuki100). The foul weather had taken it's toll on the rest. In race 1 with the rain teeming down #171 Atrhur Cook (Yamaha YFZR125) raced to a fine win dicing with #48 Ron Winban (CBR125) who just missed out in the dash to the chequered flag. #136 Ron Pulido (Honda CBR125) was also in the mix to but a brief off track excursion dropped him back to last. positions. He recovered to finish 3rd an impressive comeback. 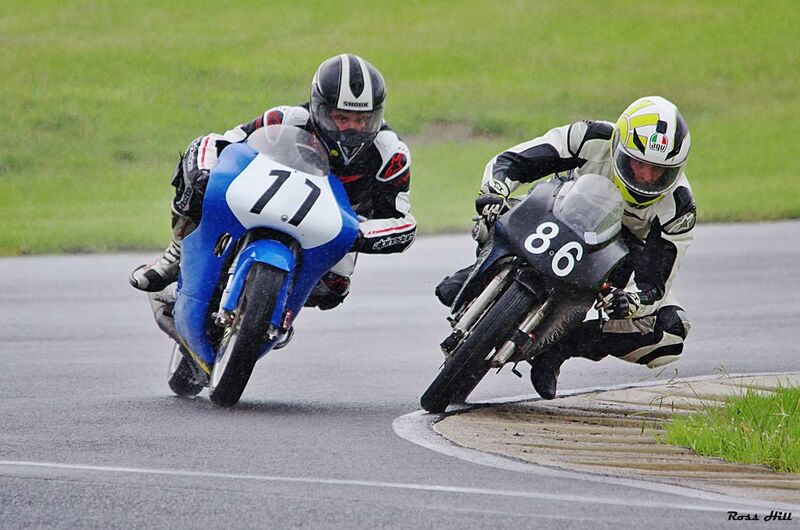 #888 Jack Robinson (CBR125) finished 4th after a steady ride and #16 Robert Young (CBR125) came 5th. Tricky conditions are evident from the pictures. Race 2 was a real humdinger with Nicolas Wenban leading the first 2 laps, then Arthur Cook slipped past into the lead but Ron Pulido was having none of it and blasted past on the last lap to take a finely judged win. Nicolas finished 3rd with Jack Robinson 4th and Robert Young 5th. 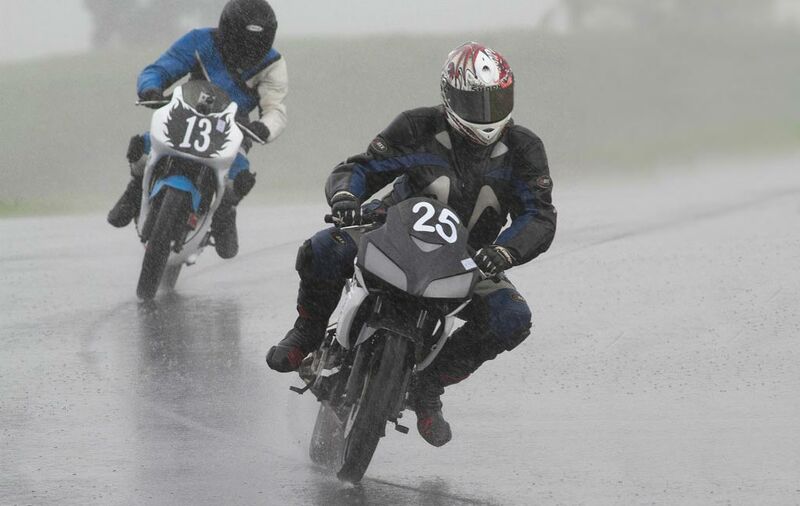 #25 Michael Lemon (Honda CBR125) showed his skill in the rain by winning both races. #73 Oliver Higgins (CBR125) came home a fine 2nd with newcomer #13 Andrew Martin (Honda CBR125) 3rd. in turn followed by #131 Rez Pulido (Honda CBR125) and #81 Robert Tisdell (Yamaha YFZR125). Andrew Martin showed plenty of class to keep it upright getting 2nd place. After a no finish in race1 Richard Cook made up for it coming in 3rd in race 2. Rookie Adam Cameron finished 4th followed home in 5th. place by another newcomer Peter Lindsay in only his 2nd race meeting. As the weather worsened with heavy rain and with water now streaming across the track in several places a riders meeting was called. It was agreed to call it a day with 2 races completed. 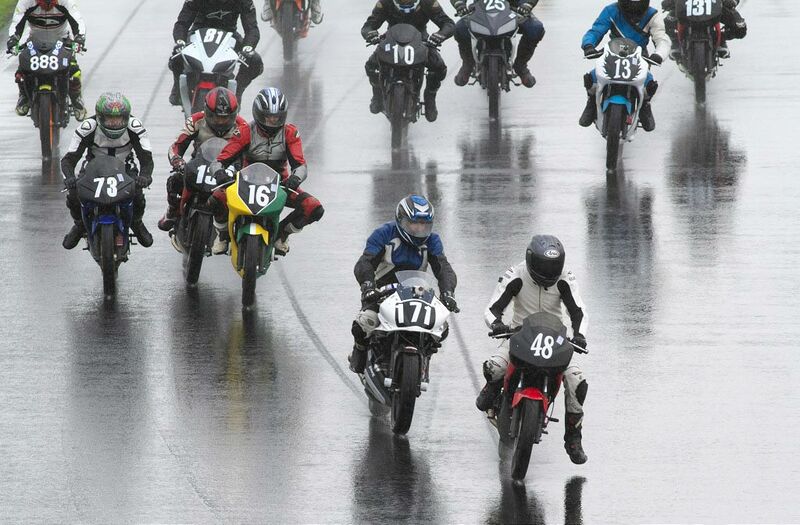 Despite the very wet conditions there was exciting racing and most riders enjoyed themselves. 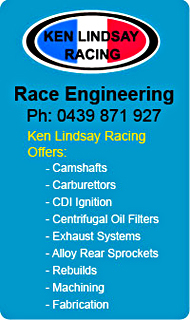 The Championship series will be at the North circuit at Eastern Creek on Saturday 31st May. Hopefully the weather will be better. Let Us Spray. 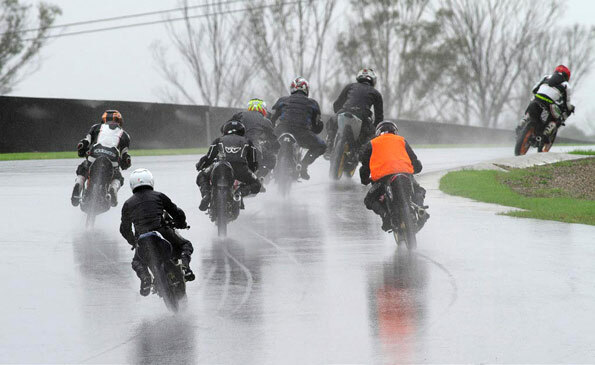 Commuterlites heading up the esses in very wet conditions. #86 Anthony Marsden steals win in race 2 from 77 Tyler Bradford on last corner. 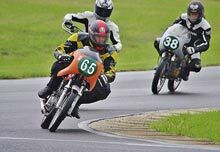 However Tyler won the Motolite class on the day riding his Big Bang Engines Harvest Pools Honda 150. to great effect in the slippery conditions. The Motolite Superlite Field get into action in relatively good conditions . Commuterlite PRO Championship leader #136 Ron Pulido splashes his way to a win in race 2. With 3rd place in Race 1 he finished an excellent 2nd. overall. Arthur Cook won the day with a 1st and 2nd. 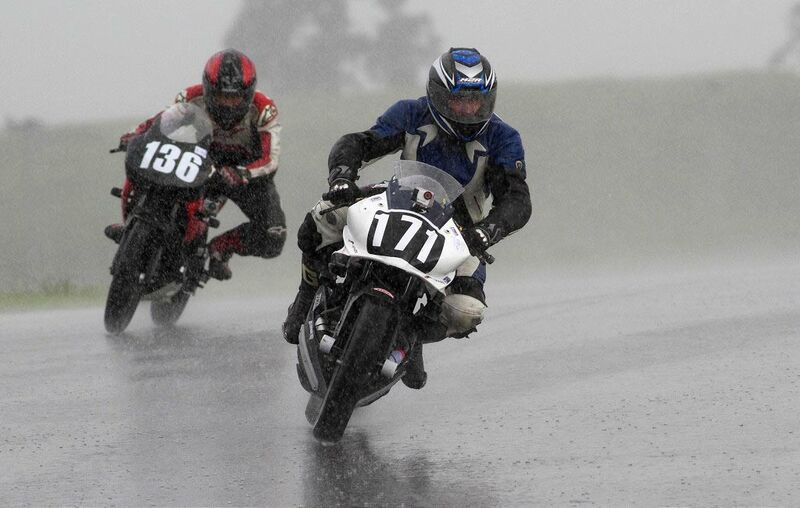 Midfield Commuterlite riders enjoying themselves in the atrocious conditions.. #17 Adam Cameron finished 4th., #3 Peter Lindsay 5th and #10 Jason Blanch finished 7th.